Few places in this world are truly exotic, but Zanzibar Island, 25 kilometres off the coast of Tanzania, is one of them. Stonetown, the capital of the ‘Spice Island’ as it is also known, is a blend of cultures, ethnicities, flavours, and history. Everything from the food to the architecture seems to feature elements from countries miles away The historic trading centre is fascinating and has to be seen to be believed. Here are my favourite things to do in Stonetown. Former capital of the Zanzibar Sultanate, Stonetown is the main settlement of Zanzibar’s main island Unguja. The town has a long history as a spice and slave trading centre, dating back beyond the 19th century. Local buildings, traditions and even food display a blend of Persian, Arab, Indian and European influences. Despite the heat, exploring Stonetown is best done on foot. Many of the labyrinth alleyways are too narrow for traffic to pass along them. This turns out well for pedestrians, as it makes strolling around the old town far more enjoyable. 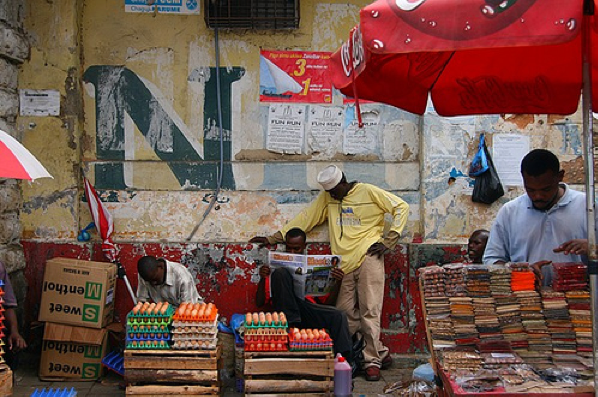 Zanzibar has been a trading hub for centuries. To see a bit of real life, head to chaotic Darajani Market. The marketis pretty full on and may be quite confronting for the squeamish. Fish, seafood, meat, fruit, vegetables, spices, clothing and souvenirs are sold at the street market. The market is interesting to explore. Traders selling items they expect tourists might buy will fight for the attention of visitors, but those selling food rarely give tourists a second glance. Tread carefully so you don’t stamp through a traders display of fresh meat, or squash several varieties of bananas, laid out on the ground. Bargaining is expected and you can get souvenirs like wooden carvings and the local sarongs (kangas for women and kikoys for men) at good prices if you bargain. Spices are also available in large quantities, and for lower prices than in the tourist shops. Little remains of the old fort, but it is interesting to see the ruined remains of the ramparts built to protect Stonetown and its residents against the invading Portuguese in the 17th century. Inside the crumbling walls of the former fort there is an ampitheatre and there are a few souvenir sellers. Now in a sorry state of disrepair after years of neglect, the House of Wonders earned its nickname because it was the first building in Africa to have an elevator. It was also one of the first to have electricity. Built in the 19th century as a home for the sultan, the building provides an insight into Zanzibari and Swahili cultures. The Palace Museum is another former palace and now displays royal household artifacts, providing an insight into the lives of the sultans. By contrast the Old Dispensary, originally a hospital, is in surprisingly good nick having been restored in the 1970s. The old building, probably the most delicately decorated building in Stonetown, has ornately carved wooden balconies and stained glass windows. One-time haunt of the great explorer and medical missionary David Livingstone as well as other European missionaries, Livingstone House is where they stayed before venturing across the African continent. It was originally a small palace built for a sultan but today Livingstone House is a tourist office. Standing out from the crowd, the spires of St Joseph Cathedral tower over the rest of Stonetown and are a well-known feature of the skyline. The cathedral was built by French missionaries in the late 19th century. On the waterfront on Kenyatta Road is Mercury House, the birthplace of Queen frontman Freddie Mercury in 1947, and today, a waterfront restaurant displaying Freddie Mercury photos and memorabilia. The focus is definitely on Freddie. Don’t go for the food. Not far from Mercury House is the big tree which is an old and enormous tree that has become a popular meeting place for locals, and also somewhere to wait for the ferry which stops nearby. It is also a good shady spot for visitors to rest between sightseeing stops. Historically, Zanzibar’s other trade was slaves. Shockingly, over half a million slaves were traded through Zanzibar in the late 1800s, mostly to Arab countries and Persia. Zanzibar’s Slave Market is a bit light on information but visitors can see the dungeon-like slave holding chambers and imagine the horror of being locked up in them. There is also a memorial and an Anglican church, built as a monument to the slaves, when slavery was abolished, on the site that hosted Zanzibar’s largest slave market. The set-up is simple but thought-provoking, and worth a visit. I always say the most authentic experiences are discovered by going where the locals go. In the evening, follow your nose to Forodhani Park on the waterfront in front of the Old Fort. 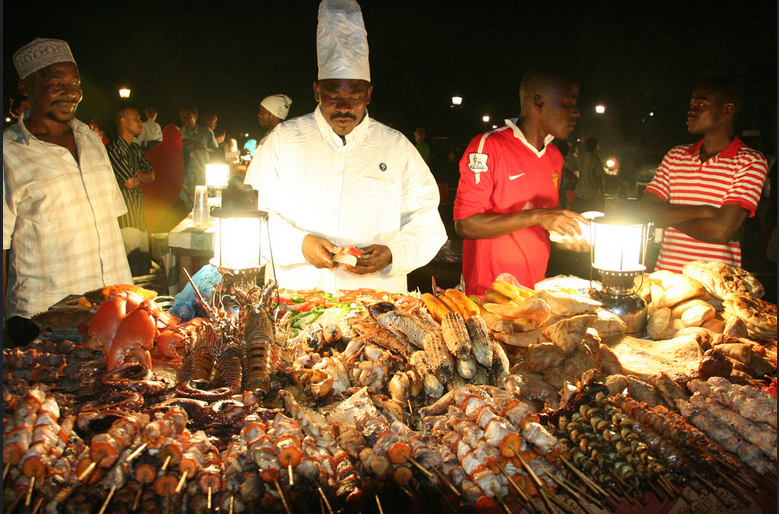 It comes alive with street food traders selling grilled fish, seafood, meat, vegetables, naan bread and samosas. You may find it a bit alarming if you’re a hygiene freak, but if you can get over that the Zanzibar pizza, sugar cane juice and deep fried potato balls and beef cubes are worth a try. 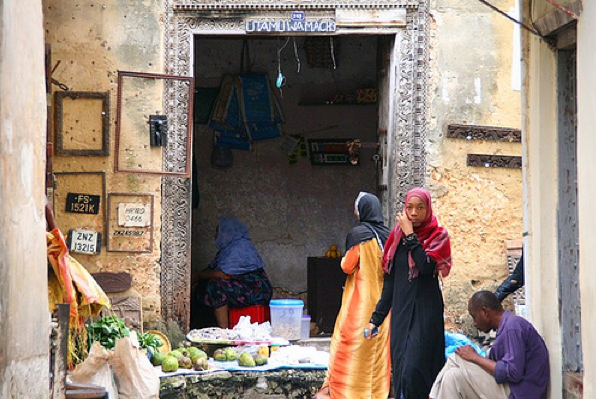 Zanzibar’s blend of Moorish, middle eastern, Indian and African traditions and architectures is more evident in Stonetown than the smaller settlements of Zanzibar. It is no surprise Stonetown has been UNESCO heritage listed since 2000.